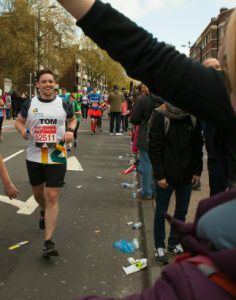 Our warmest congratulations to Arthritis Action Member and our first-ever Marathon runner Tom Jones for competing at the Virgin Money London Marathon on 24th April 2016! Tom completed the race in record time, raising £2,934 in aid of Arthritis Action. This including gift aid, raised the final total to a very impressive £3,549. Tom was diagnosed with Ankylosing Spondylitis in his late teens, a form of arthritis which can cause vertebrae in the spine to fuse together, limiting movement and causing severe stiffness. Following his diagnosis, Tom began educating himself on how to self-manage the pain of his arthritis by introducing exercise to his daily routine, which significantly reduced inflammation. With systematic exercise and making use of Arthritis Action’s resources, he regained confidence in knowing his body’s abilities and limitations. From everyone at Arthritis Action, we want to thank Tom dearly and wish him a huge congratulations for his incredible work!